Your agents report that the Red team has launched a wide spread campaign in the north county, but was easily crushed by the independent towns. Gang of privateers size 1. Do we have any idea of who was the oposition which provided us with +6 points in the first round? As is the case with revolts, the ID of defenders are never revealed. The TH assessment screens show nothing of note in the militia hiring records. Let this be a lesson for you. Never doubt the all powerfull all knowing Arbitor! Your Spy in Stafford reports that the town was seized in a massive wolf uprising. 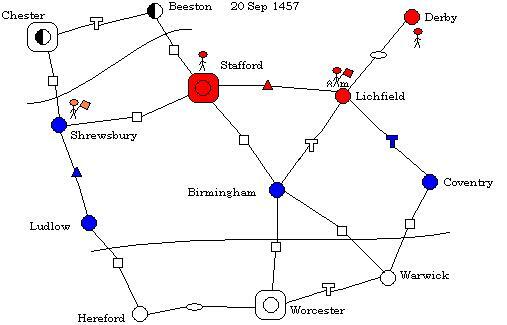 Your spy in stafford notes that the Red Team has repulsed an assault on the castle, and failed in their counter attack against the town. You've discovered a cache of 40 gold in Birmingham. You notice the Red team army is outside the gates of the city. Jorne has inflicted on Arthur_Loxley a Serious wound - out for 2 days, sword and shield destroyed. Can the spy tell us how many revolters survived the attack at Stafford? Brigands, privateers, and wolves last until they get incapacitated. Shriveled apples are flavor text. I was feeling punchy, and besides, you needed something to feed Telcara's good luck squirrels. Telcara's squirrels kept the town from falling for 6 rounds I think I need to get back to Coventry and change them to lemmings... DOWN TO THE BEACH MATES!!! None of your nodes have been taken.